Kudzu is the common name given to several species of invasive vines in the Pueraria genus. Kudzu vines are native to Japan and China but have been introduced to parts of southeastern United States. The Kudzu is extremely invasive, growing over just about anything and everything in its way. Since it was introduced it has covered houses, abandoned barns, buildings, street signs, and much more. Eradication of this vine is difficult and time consuming however, there are methods to keep it under control. The design of Kudzu can be identified by its dark large green leaves and three lobes that grow in groups of three. Underneath the dark green leaves there is a hairy underneath. The kudzu has the potential to grow from 10-20 meters sometimes even reaching 30 meters! 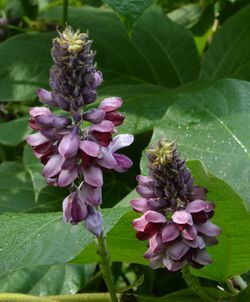 The Purple flowers of Kudzu bloom in the late summer from that point The flowers grape like fragrance attracts bees and other pollinating insects to help pollinate the flowers. For some unexplained reason a few of the seeds will sprout and grow into new plants the seeds then mature into a hairy, bean like pod come the fall. when quickly glancing at the Kudzu its leaves may look like the Poison Ivy. But unlike the poisonous plant the kudzu has much more hair underneath than the Poison Ivy. Crown vetch (Securigera varia) has a similar uniform growth pattern, however the Crown vetch leaves are finer with close to about 25 leaflets per leaf. It’s pink flowers in tight clusters contrast the purple flowers of the Kudzu. Some can even get confused with the “round-leafed beggar’s tick and the “Kudzu”. The difference is however that the trailing Desmodium rarely grows to lengths of more that 5 feet and leaflets are rarely over 2.75 inches long. Climbing vine is a perennial plant (meaning one that lives multiple years). They grows until disturbed or destroyed. Kudzu can grow to about 7 feet (over 2 meters) in just one week in optimum climate and soil conditions. During the winter, especially in the south of America where the weather is moderate, the leaves will die off leaving a gray and dry vine. But when the summer returns the kudzu will start to grow again from the same point where the winter stopped it the year before. In late summer, the kudzu produces beautiful and aromatic flower blossoms. Kudzu's provide a very tiny amount of seeds, because after the winters frost, most of the pods are dry, which withers it seeds away. The seeds take about 15 days to peek out of the ground. If this vine is not under major control, it will grow over anything in it's way. Kudzu mostly lives in the southeast because of the well-drained eroded lands. For this reason Kudzu was promoted to be used as an erosion control. However it will not grow in very wet or thin hard-pan soil. It can survive through harsh hot temperatures and dry seasons.Kudzu will grow in most places with abundant sunlight such as the southeast. It lives in areas with mild winters and hot summers with temperatures ranging from 40°F to 60°F in the winter and over 80°F in the summer. It requires high temperature (86°F to 95°F) during the summer to preform photosynthesis. In more of a sandy land, kudzu roots can dig into the ground to as much as 4 meters, making it almost impossible to get rid off, they can also grow to having a diameter of 10 cm and more. Kudzu covers and suffocates the surrounding plants of sunshine. The Kudzu just completely takes over the surrounding vegetation. 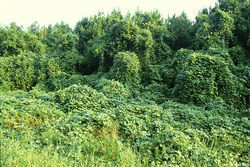 Since Kudzu will grow over anything and about 1 foot per day it can be difficult to remove. To prevent spread it must be completely removed with roots. After that it must be watched for regrowth which must be removed also. After removing Kudzu it is strongly recommend that another plant is planted there to prevent regrowth. Kudzu older more than 10 years old has woody knots on surface where the originated from. Some vines (depending on how much there is) can be completely destroyed in about four years. Using certain pathogens can help in the process of eradicating the vine. Burning is recommended in March to kill small plants and leave roots for treatment with herbicides. More herbicide is required for older roots. Herbicide usage is recommended for use in late summer for best results. If not used carefully when getting rid of, weed killers and herbicides can cause damage to other plants and animals. Another way of getting rid of kudzu is feeding it to the cattle. Also there been news of a new bug that was transported from Asia to America in 2009, that eats kudzu's. But its dangers are that it also eats soybean plants, which has caused less soybean production in some places. Another way to prevent the spreading of this invasive vine is not to buy, plant, or trade this vine. . Biological control is still in development. This is a little history of everyone's favorite weed: Kudzu! It was originally a news-style package (hence the ending). It was produced by Robbie Tullock in September of 2007. ↑ Pueraria montana (Lour.) Merr. kudzu USDA. Last Accessed 22 October 2013. Author Unknown. ↑ Pueraria Wikispecies. Last modified on February 12, 2012. Author Unknown. ↑ Kudzu Vine Encyclopedia Britannica. Last accessed October 9 2013. Author Unknown. ↑ kudzu Florida State University. Last accessed October 9 2013. Author Unknown. ↑ 5.0 5.1 5.2 5.3 5.4 5.5 Kudzu Control Missouri Department of Conservation. Last accessed October 9 2013. Author Unknown. ↑ The Kudzu plant FAQ Kudzu World. Last Accessed October 5 13. Author Unknown. ↑ 7.0 7.1 The Kudzu Vine jjanthony. Last Accessed 6 October 2013. Author Unknown. ↑ Kudzu Seeds Kudzu Kingdom. Last Accessed 7 October 13. Author Unknown. ↑ 9.0 9.1 9.2 Pueraria montana var. lobata US Forest Service. Last Accessed 13 October 2013. Author Unknown. ↑ 10.0 10.1 10.2 10.3 Kudzu University of Florida. Last Accessed 13 October 2013. Author Unknown. ↑ 11.0 11.1 Kudzu “Invasive plants of the Eastern U.S”. Date-of-access October 20, 2013. Author Unknown. ↑ Kudzu: How to get rid of Kudzu PestControlRX. Last accessed 20 October 2013. Author Unknown. ↑ Kudzu “Washington Invasive Species Council”. Date-of-access October 20, 2013. Author Unknown. This page was last modified on 29 October 2015, at 19:17.